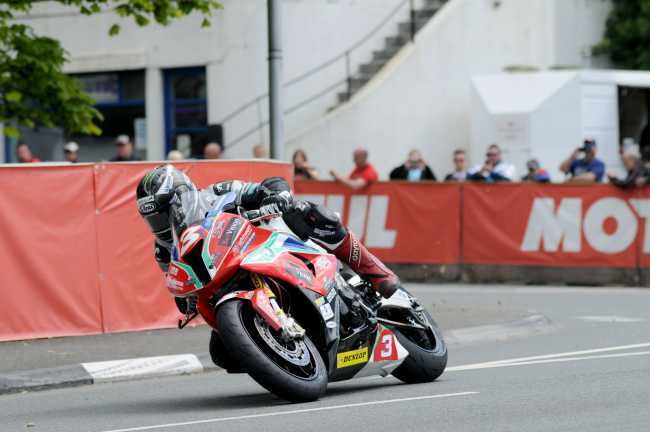 Ian Hutchinson won his second race of the week at the 2015 Isle of Man TT races, fuelled by Monster Energy, when he took the RL360 Superstock race on Tuesday afternoon obliterating Michael Dunlop’s race record by 32 seconds. In a stunning race the top four – Hutchinson, Michael Dunlop, Lee Johnston and James Hillier were all inside the old mark. Hutchinson’s PBM Kawasaki rider took control at the half race distance point and the ‘Bingley Bullet’ eventually ran home victor by just under 20 seconds from early leader Michael Dunlop. Lee Johnston nipped in for the final podium place, his first TT podium finish, after getting the better of James Hillier in a thrilling final lap. Dunlop set the early pace and he led at Glen Helen by 1.1s from Hillier with Hutchinson in third and Guy Martin in fourth ahead of Johnston and Gary Johnson. By Ramsey, the Northern Irishman still led and had added a second to his lead with Hutchinson now relegating Hillier to third. An opening lap of 130.932 gave Dunlop the lead from Hutchinson by 1.6s with Martin now up to third, 3.3s behind. All three were over 130mph with Hillier, Johnston and Hickman completing the top six. The gap remained the same for the first half of the second lap but Hutchinson started to reel Dunlop in, getting the gap down to 0.8s at Ramsey. However, the MD Racing BMW rider responded and as they came into the pits, his lead was back up to 1.9s. Martin had dropped back and was now eight seconds adrift with Johnston, Hillier and Hickman maintaining their top six positions. Johnston posted his first 130mph lap of the Mountain Course at 130.285. At the pit stop, Hutchinson changed his rear tyre whilst Martin lost a significant amount of time when the Tyco BMW refused to fire. However, the change in rubber worked wonders for Hutchinson and with more grip, he shot into the lead at Glen Helen, his margin over Dunlop now 2.7s. Indeed, as the lap wore on, he continued to pull away and his advantage was almost ten seconds going into the final lap. Martin had dropped all the way down to seventh and it was Hillier, circulating on the road with Dunlop, who was now up into third ahead of Johnston, Hickman and David Johnson. Hutchinson wasn’t to be denied his second win of the week and he increased his lead all the way round the final 37.73 miles to eventually cross the line 17.2s clear for his tenth TT victory. Dunlop had to settle for second but the battle for third went all the way to the chequered flag and it was Johnston who grabbed it from Hillier by just 0.270s after a stunning final lap of 130.851. 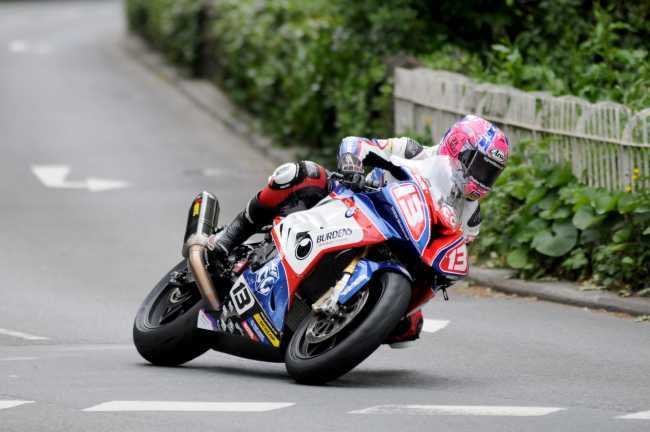 Hickman took a brilliant fifth in just his second TT with fellow BMW riders Johnson and Martin following him home in sixth and seventh. The three Hondas of John McGuinness, Bruce Anstey and Conor Cummins completed the top ten.